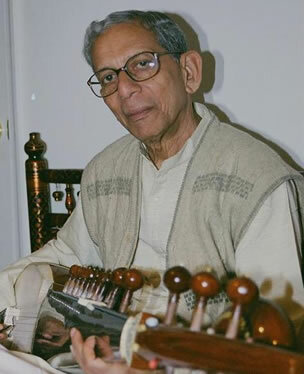 Samarendra first learned to play the Sarod from his uncle, the late Surendra Nath Sikdar. Later, he went on to become a disciple of Radhika Mohan Maitra. In a musical career spanning over 60 years, Samarendra meticulously learned and mastered the playing style of the Shahjahanpur Senia-Bangash Gharana as Pt. Maitra himself did. A puritan like his guru, he believes that the true beauty of Indian Classical Music is in keeping the Ragas and their compositions pure and unaltered from their original forms. He has been cited by many music critics and connoisseurs as being the ideal student of Radhika Mohan, namely one who has closely followed his style of playing. In addition to the late maestro, Samarendra also received inspiration and guidance from the late Pt. D.T. Joshi, a musician in his own right and a close friend of Pt. Maitra, as well as other senior disciples of Radhika Mohan, such as Pt. Buddhadev Dasgupta and Nemai Dhar (father of Naren Dhar). His budding talent was recognized by Radhika Mohan when he asked the young Samarendra to accompany him in a Jugalbandi (duet) for the National Program of Music in All India Radio, New Delhi, in the year 1966. Samarendra went along with his guru from Calcutta to New Delhi, thinking that he would merely get an opportunity to shadow his guru during the recording. But surprise followed, as Pt. Maitra turned to him and asked him to play solo for nearly 30 minutes. As it turned out, the program was on Guru-Shishya Parampara, the great tradition of Indian music, where the knowledge of music is passed on from generation to generation, and Radhika Mohan wanted to demonstrate that he had created his successor. Guru – Shishya tradition: Pt. Radhika Mohan accompanies by his senior disciple Pt. Samarendra Sikdar and tabla maestro, Pt. Shyamal Bose at a concert in Calcutta, India. More recognition followed over the years, in various concerts and radio programs all around India. He played in music concerts in Calcutta, Delhi, Bombay, Allahabad and Benares. He was invited wherever music lovers wanted to hear the true style of the Shahjahanpur Gharana, the style that Radhika Mohan and his guru, Ustad Md. Ameer Khan had established. In the year 1983, All India Radio also featured him in its prestigious Tuesday Night Concert event. 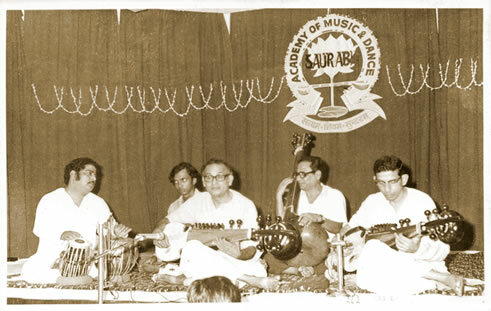 In addition to being a full-time musician, Samarendra also served as a staff artist of All India Radio for a long period of time. During this period, he came into contact with various musicians and enjoyed the company of the most talented in Calcutta; Pt. Jnan Prokash Ghosh, Pt. D.T. Joshi, Pt. Shyamal Bose, Ustad Keramatullah Khan, Pt. V.G. Jog, Ustad Md. Sageeruddin Khan, to name a few. He has also carried forward the great tradition of his Gharana by being an excellent teacher of instrumental music. 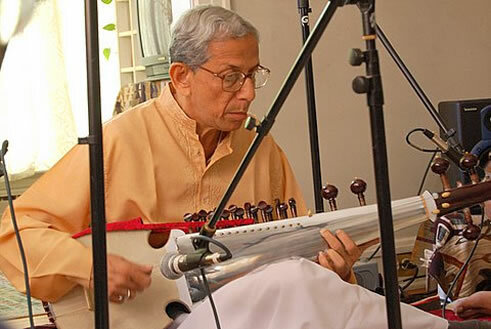 He has taught many students of the Sarod over the years and has created talented musicians like Soumya Chakraverty, Tanushree Chatterjee and others. He taught regularly for a while at the Md. Ameer Khan School of Instrumental Music, set up by his guru. After the death of Radhika Mohan in 1981, Samarendra also began teaching some of his guru’s disciples such as Somjit Dasgupta and Bhaskar Sen.
Samarendra currently lives just outside of Kolkata, India. Due to his age and failing health, he has stepped away from the performing stage, however continues to teach his music to the next generation. His wife, Mrs. Kalyani Sikdar is also a prominent vocalist in her own right, having trained for years under Dr. Amiya Ranjan Banerjee of the Bishnupur Gharana. In this audio clip, you can hear Samarendra play Raga Bhairav Bahar, a rare morning melody that is conjured by mixing Raga Bhairav with the springtime Raga Bahar. Finally, in this video clip you can watch and hear Samarendra play another rare evening Raga Chhaya Behag. He is accompanied on the Tabla by Dibyarka Chatterji.